Except for the last bullet, because I am obviously not an expert in black hair care, I have tried all of these with great results. You may have a different reaction. Use at your own peril here. As a "hot oil" treatment, you can take a small spoonfull right out of the jar and use it just like that. Warm it up in your hands (it's solid until about 75F) and then apply it to your hair. Wrap your head in a towel and let your body heat help it soak in for half an hour or so. Shampoo and condition like normal, and your hair will be soft and shiny after your shower. As a frizz treatment. Take a tiny, tiny amount and warm it up in your hands. Then just smooth it over your hair the same way you would and frizz cream. It'll have the added effect of making your hair super shiny too. But a word of caution: a little dab it all you need. A very little goes a looong way with this stuff. More labor intensive hot oil treatments. I love this set of recipes from Crunchy Betty. She's even got some great recipes there for infusing your oil with herbs. Not only will your hair be awesome, but the house will smell delicious! According to the internets, coconut oil is apparently brilliant for the hair of people of african descent. I do remember that "african" (I honestly dunno what else to call it.) hair has a much more open cuticle and is therefore more prone to damage. So I imagine that coating it in oil would protect it a bit. I found this article, which seems to support my assumption here. Whether or not it's true, the oil isn't going to hurt. 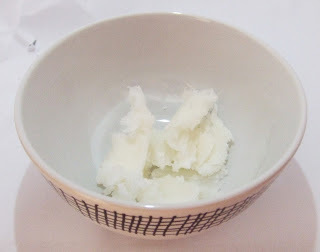 The only thing I worry about with using coconut oil on the skin is that it is pretty high on the comodogenic scale, which means it'll clog your pores. But some people have used it for years with no adverse effects. Your Mileage May Vary. I don't use it on my face at all, so attempt this stuff at your own peril. It's almost a no-brainer that coconut oil would be great for removing make-up. Just like olive oil, baby oil, etc. It should remove waterproof mascara and eyeliner fairly easily. I found a recipe for DIY eye cream. I've seen this all over pinterest, but I don't personally know anyone who has tried this. I am very prone to millia, so I would never use this on my eye area. But it's definitely an idea that the more adventurous should investigate. Just not me. Ever. Body moisturizer. I have tried this before, and was more or less pleased. It definitely softened my elbows and knees, and left my legs very smooth without being greasy. I wouldn't do this if you were planning to be outdoors all day...unless you wanted to see what bacon feels like. I imagine you would fry yourself pretty quickly. I also don't really recommend it for your feet. A product like vaseline does a much better job of softening hard feet that coconut oil did for me...and I even tried the "socks overnight" method. After manicure care. I do this all the time! I just scratch the inside of the jar with my nail, and that is enough to cover my knuckles and cuticles with oil. It heals all the damage that my acetone remover causes. It'll also give your bare nails a lovely shine. Just don't try to use your smartphone or open a door for a while afterwards. You will regret it. You could also add a very small amount to your bathwater. Like I mentioned earlier, it melts at a pretty low temperature, so bathwater would dissolve it competely. And a little oil in the bath is so nice, it'll make your skin very soft. Just be careful, it'll also make you and the bathtub slippery. Please don't kill yourself. As for cooking and cosmetics, well, there are too many uses to list here. Any recipe that you would cook something in olive oil, butter, what-have-you...just use coconut oil. It fries things as well as anything else. In cosmetics, I've only made lip balms so far. But it seems to work very well with beeswax and other oils. TL;DR is get some coconut oil. You probably won't regret it. I use it on my skin! It works GREAT. I recently had a really bad reaction to some night cream. My face ballooned up and I had red patches all over. I talked to my doctor, and she told me to put no make-up on my face. That included lotion. My skin felt horrible, though. I felt like I had scales on my face. It hurt. That's when I started putting coconut oil (which the doctor okay'd) on my skin. I'd put on coconut oil several times a day, then use a gentle exfoliant once in the evening. Within a week, all of the dry skin was gone, and my skin was super soft. These days, I put some on before my evening bath, chill out for a bit, then wash my face as normal. Just enough is left behind to keep my skin soft and hydrated. No pore clogging, either! you're so lucky that it works for you. I've always been afraid to try it on my face. I use grapeseed oil instead, but with the same process. Coconut oil might be the best thing ever! I love coconut oil, pretty much for everything you mentioned... also just figured out something else fun to do with it. I use cheapo table salt (the fine-grained kind, not flakes or big crystals - just the cheapest table salt) and pour some into a spoonful of melted coconut oil and use that as an ultra-scrub. It's nice because if I want to do a scrub within an inch of my life, I can do that and the oil keeps my skin from drying during the scrubbing, and I can also just use less salt to make it a light exfoliation. Then it's wipe off with a warm washcloth and done. I'm seriously never buying another scub, this is the best thing ever. So can you tell us more about making lip balm with coconut oil? I would LOVE to do that.